Last week we wrote about changing the name of one of our apps, shoutrDrive, to Wireless USB as an ASO measure. ASO, or app store optimization, measures serve to improve how well potential customers find your app in the app store when he/she is looking for it. We assumed that people searching for apps on Google play did not understand what shoutrDrive does from its name. Therefore, we gave it a more descriptive name: Wireless USB. As it turns out this assumption was wrong. We could not observe a significant increase in downloads over the past week. This could mean one of two things. Either the name is not significant or the name we gave it does not tell people any better what our app does. Time to reiterate. Interestingly, we have observed that another app with the same name, Wireless USB, is doing much better in the app store. Fortunately, this app is also ours. Before starting with shoutr, our team-members Christian, Benjamin and Sebastian already had their own app smithy, CoboltForge. 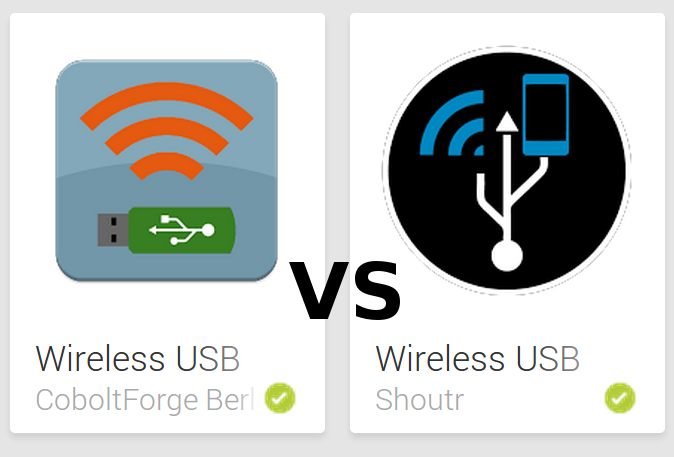 We have been using CoboltForge’s developer account in order to do some A/B-testing with Wireless USB. We have been playing around with both versions of Wireless USB in terms of design. This means that both apps have the same underlying code, but different logo and UI-designs. The immediate conclusion you would draw from this is, of course, that the logo and UI preview you get in the app store draws more people to download the CoboltForge version. This might be a false conclusion, however. The matter of the fact is that CoboltForge as an app publisher has more apps in the market than shoutr, some of which have relatively high download numbers. It makes sense for Google to prefer trusted app publishers rather than newer ones. Thus CoboltForge’s Wireless USB is ranked higher in the app store. Apps that rank higher are, of course, more likely to be picked by users. To figure out whether this last assumption is true or not we will bring the more successful UI to shoutr’s Wireless USB. If the download rate increases, we know that it was the UI. If it does not, we know that shoutr will have to build its reputation.